Birthday Status For Daughter : Daughter’s birthday is the wonderful occasion for parents to cherish their love for an adorable daughter. A daughter will always remain daddy’s little girl and mommy’s mini version no matter how old she gets. Your daughter’s birthday is a chance to express your deep loving feelings to your daughter by saying happy birthday daughter. Greet your daughter with these best birthday status for daughter and happy birthday wishes messages for daughter from our compilation! 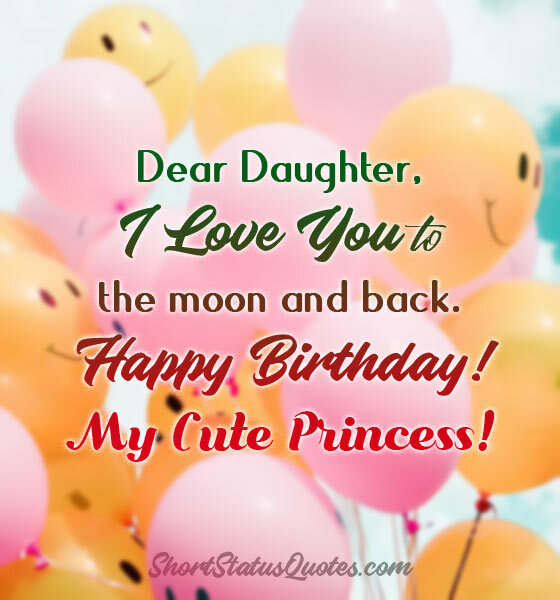 Here presenting all birthday status for daughter are able to convey your love and well wishes to your cute daughter! 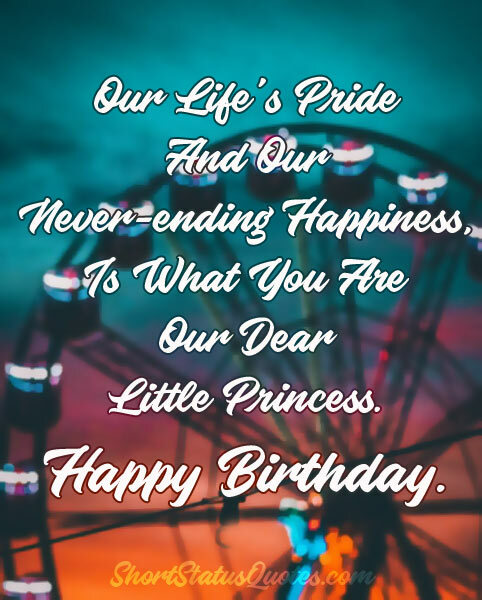 Choose the best B’day quotes for daughter and share with her! May you continue to put the smile in our faces and be a constant reminder that we did a very good job in raising you. Have a happy birthday, my little princess. I love you more than a greedy cat loves food. And that means a lot! Even though we are not a royal family we have been blessed with a princess so pretty. Happy Birthday to my darling daughter! Happy birthday to my sweet little princess. Thank you for coming into my life and filling it with happiness. I love you from the bottom of my heart. Our hearts beat for no one but you, ever since the day we heard you say boo. Happy birthday. Daughter, you are a beautiful and smart young woman. I could not be more proud of you. I love you. Happy Birthday, sweetie! My big girl, I don’t think it’s possible to love someone as much as I love you. Have a very wonderful birthday. You will always be our little princess. But today, you have become a mature queen. You mean the world us! Happy Birthday. I smile every day because you are my daughter. Words are not enough to express how much you mean to me. Happy Birthday, my lovely daughter! Can’t believe you’re another year older. I wish I could slow down time. Happy Birthday. I am proud to say the mini version of myself is way better than the original one. Happy birthday, sweetheart. Always have a faith in yourself and live your dreams! Wishing you a beautiful birthday, my dear daughter! To the birthday girl, remember that you are treasured above all others in my eyes. I love you so much. Having you as my daughter is my greatest accomplishment — and I didn’t even do a thing. You did it all, just by being you. Happy birthday, sweetie! Whatever you want in your life, you can achieve it because, in you, I see a great achiever. Happy birthday to you, my beautiful angel. You will never realize why we love you so much until the day you become a mother to a darling daughter like yourself. Happy birthday, sweetie. We feel so proud to see that our little baby has grown into such a fine, young beautiful woman. We just couldn’t be any happier. Happy Birthday to you, angel! Happy Birthday to you our beloved daughter! You are the most precious thing in our lives. May your life always be filled with love and happiness. If there existed a word to describe daughters like you, it would be the most beautiful word to ever be written. Happy birthday, dear. Happy Birthday to the world’s most amazing daughter! I cannot believe how the years have flown by. You have become an independent woman, but you will always be my little girl. Your happiness and your success – these are the only two things we want in life and we are doing everything we can to help you get them. Happy birthday, dear. Happy birthday to our favorite girl in the whole world, we love you so much! Your birthday is truly special to us because that day we met our greatest pride and joy for the first time! Daughters are precious, kind little girls. I dreamed of the woman you would become, and you have far exceeded my expectations. I am so proud of my little girl. Happy Birthday, daughter! Dear Daughter, stay beautiful and always stay my little sweet girl. Wishing you tons of good, sincere birthday wishes. On your special day, my dear, I‘d like to wish you the greatest happiness that can be in this world! May your special day be as bright and sunny as you are to me! I am sending you kisses and all my love, dear. My daughter, I wish you love, joy, happiness, and all the positivity in the world on your birthday. Cutie pie, you make our hearts sing with joy. May your birthday and every day afterward be a song of love, joy, and beauty. You are truly the love of my life, dear daughter. May all your desires be fulfilled on this special day of yours! Happy Birthday! You may have outgrown our laps, but you will always be our little princess. We love you more than life itself. Have a happy birthday! Dear daughter, may you always stay happy and healthy… That way, you can still take care of us when we become old. Wonderful Bday! Having a daughter is truly a gift from God. This also means seeing a thousand rainbows each day and a thousand more reasons to smile every day! Best bday to your our dear daughter! You are the biggest achievement in my entire life! You give me something no one else can. Happy Birthday, my wonderful daughter! I will always love you! In all this birthday madness and party craziness, remember that you are the reason we celebrate on today. Enjoy your special moment. Birthdays are special days, and today is your day, my angel. May you have a blessed and very Happy Birthday, daughter. Happy Birthday, our little angel! On this special day of yours, we want to remind you once again of how much you mean to us. Our love for you will never end! Happy birthday to the most beautiful flower on the planet, we love you endlessly. Best wishes on your birthday! I hope it is as sweet as you are. Happy birthday to the world’s most amazing daughter! I’m so grateful that I have you as a daughter. Happy birthday, sweetie! A daughter like you is a gift from God. There’s no other way to explain it. Happy birthday, sweetie! Lip color, gloss, eyeliner and mascara – you have finally grown old enough to enjoy all these as you progress to your life’s new era. Happy birthday. We hope that our Birthday Status for Daughter and Happy Birthday Daughter Wishes Messages could make you satisfied and fulfill your search demand! 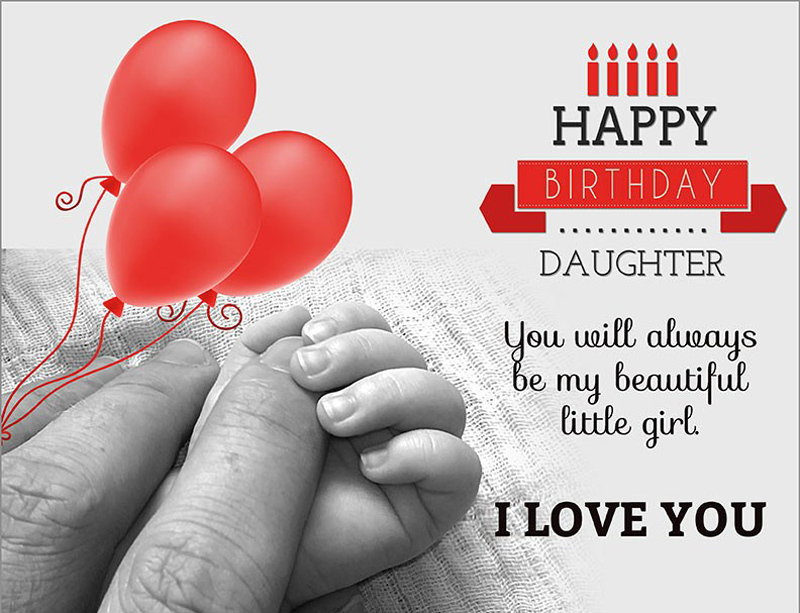 Share these B’day quotes to show your daughter how much she means to you!